Golden Mile Food Centre used to be where I go to after “settling stuff” at the Army Market upstairs – the place of relief for many army boys and NSMen. Buy in-camp things then go downstairs eat. 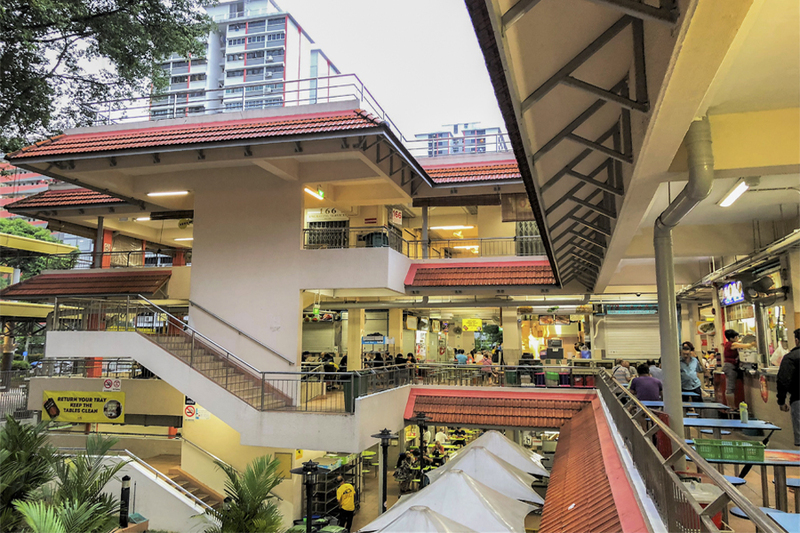 The food centre which was opened since 1975, has a good mix of stalls both upstairs and downstairs. 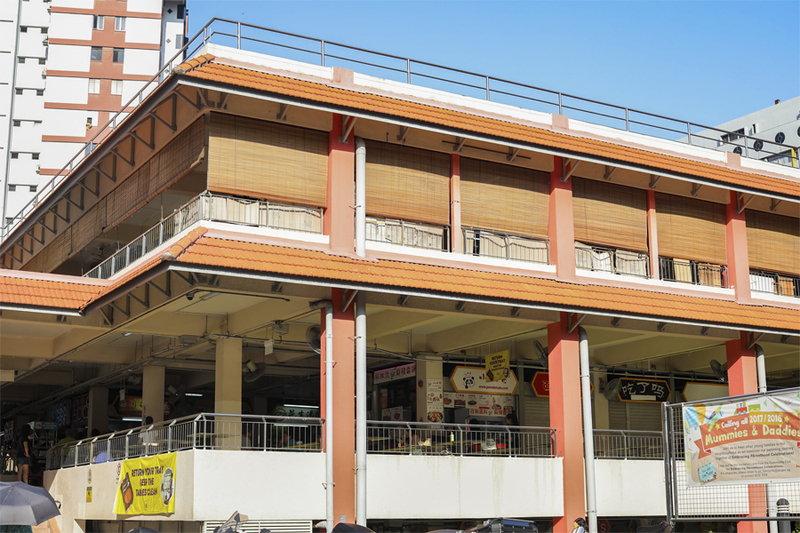 Most of the Halal stalls are located downstairs. When I visited during the weekend evenings, there were also performers singing oldies which really added to the atmosphere. 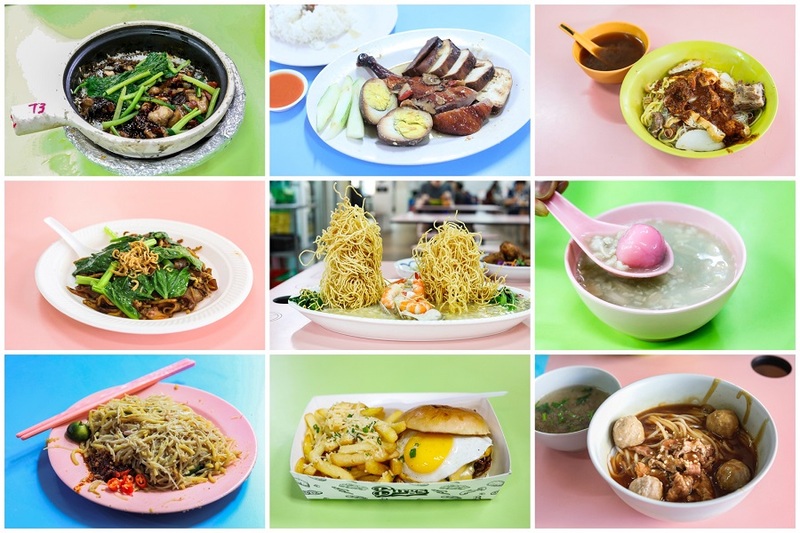 There are many other famous and worthy stalls here, such as Ah Xiao Teochew Braised Duck, Golden Mile Special Yong Tau Foo, Charlie’s Peranakan Food, Mr Baguette, Zhao An Granny Grass Jelly, Da Po Curry Chicken Noodles, Keng Heng (Whampoa) Teow Chew Lor Mee, Haji Kadir Food Chains (for Tulang and Roti John), and Koothurar Nasi Biryani. Give me some time to finish all. Chinatown stalls on a local television competition many years ago. However, warning warning, you have to wait a good half an hour as the stall is often crowded as your food is prepared fresh on order. But it is well worth the wait. 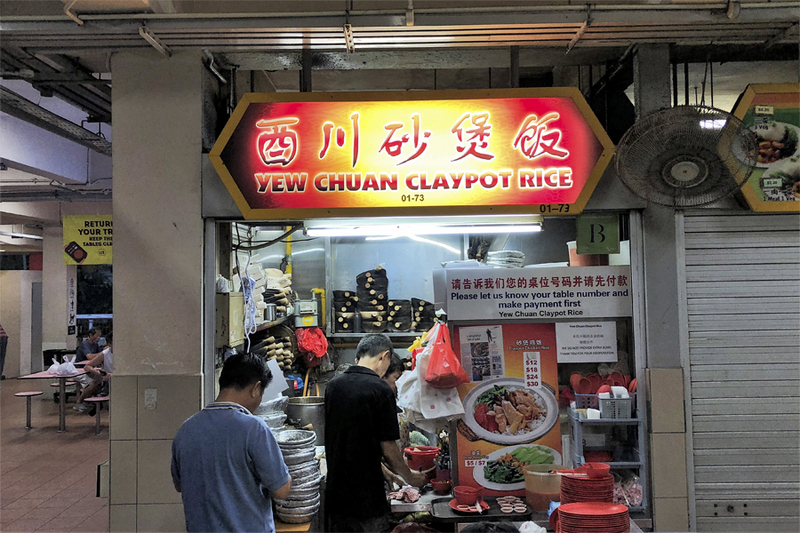 Yew Chuan’s Claypot Rice is a classic – fragrant rice which was topped with tender marinated chicken pieces, tasty Chinese sausages, fresh green vegetables and light traces of salted fish. The winner was the soya sauce, thick and dark, yet not overly salty which would usually make one thirst. Added with a formulated sweet chilli sauce, the combination was aromatic and addictive. Cooked over charcoal, the moist rice was soft and fluffy on the bite. It complimented well with the slightly salty meat and sausage slices. One wished for some mushroom pieces for an added texture though. 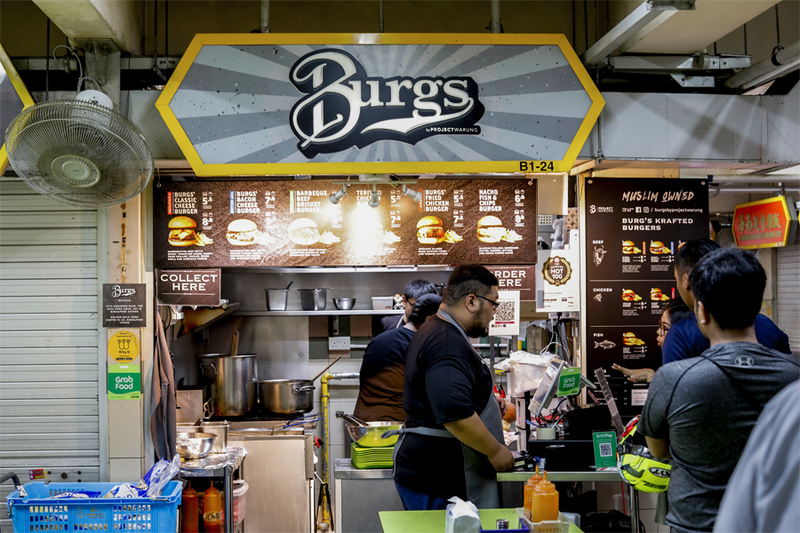 Burgs by Project Warung serves up halal and fresh, appetizing burgers at an affordable price. 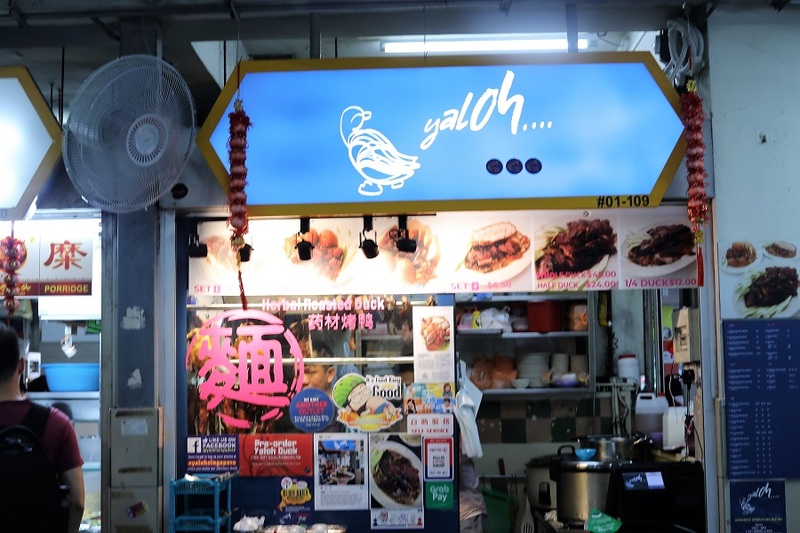 This stall really raises the standard of fast food items available at hawker stalls. They have a great line up of juicy and succulent halal burgers ranging from fried dish to grilled chicken thigh. The queues are long and the burgers sell out like hot cakes so make sure you get to the stall well before lunch time. Some of their signatures include the Burgs Classic Cheese Burger ($5.50, $8.00), Burgs Bacon & Cheese Burger ($7, $9.50), Barbecue Beef Brisket Burger ($6, $8.50), Teriyaki Chicken Burger ($5.90, $7.90), Burgs Fried Chicken Burger ($5.50, $7.50) and Nacho Fish & Chips Burger ($6, $8). The beef burgers are recommended for the juicy patties with unique concocted sauce. 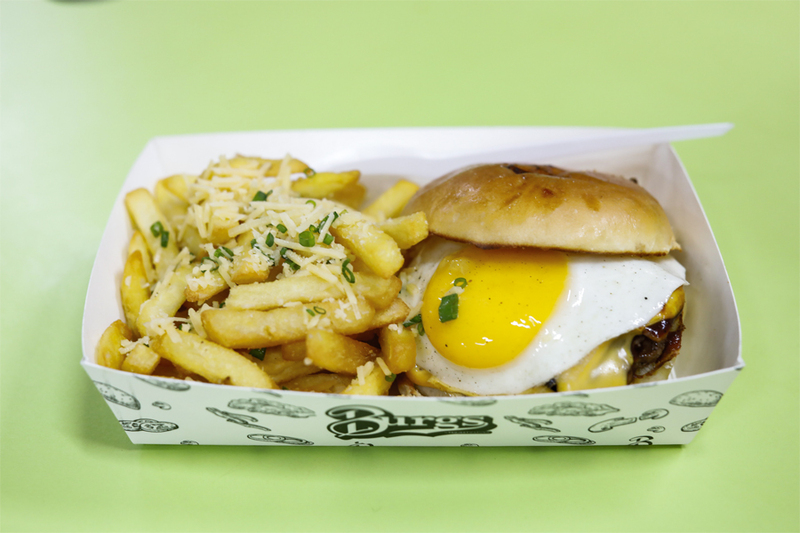 They come alongside a generous amount of thick cut fries and the taste really pays homage to local flavors. 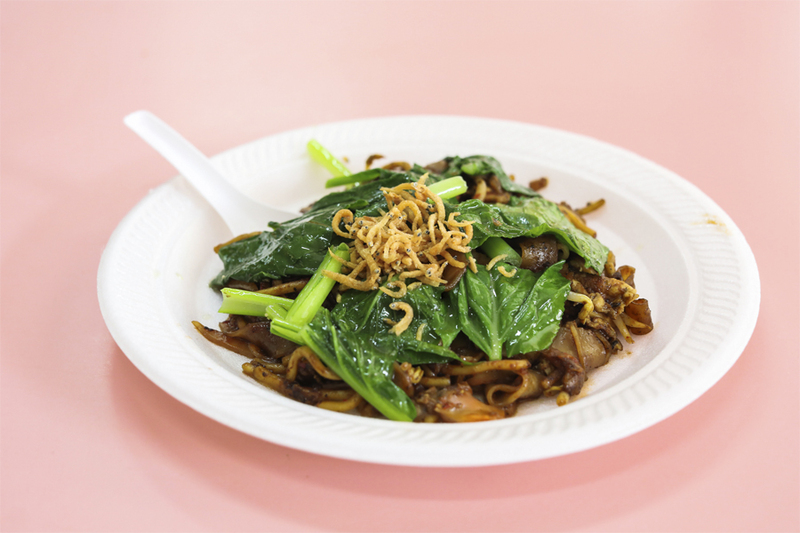 Enjoy greener and healthier options at the Char Kway Teow to fulfill your cravings with less guilt. 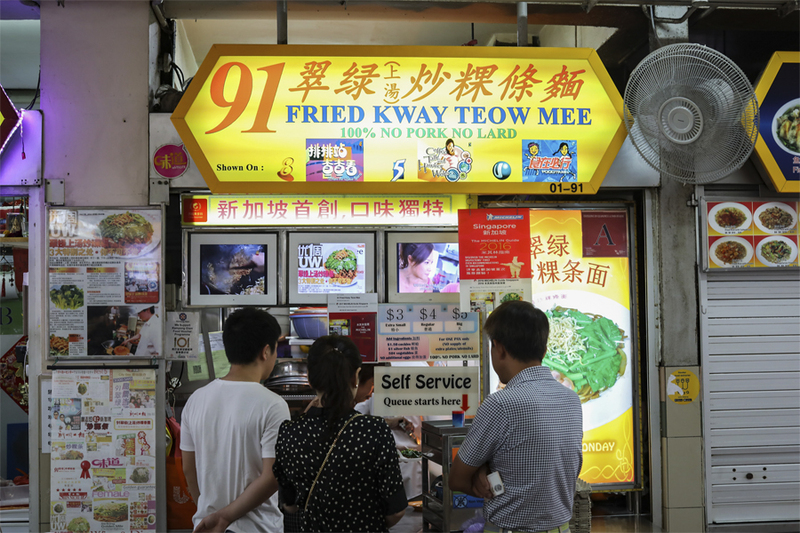 Named after the stall’s number at the Golden Mile Food Centre, 91 Fried Kway Teow Mee 91翠绿炒粿條面 is known for its healthier version of Char Kway Teow – no pork, no lard, added with toppings of chye sim. 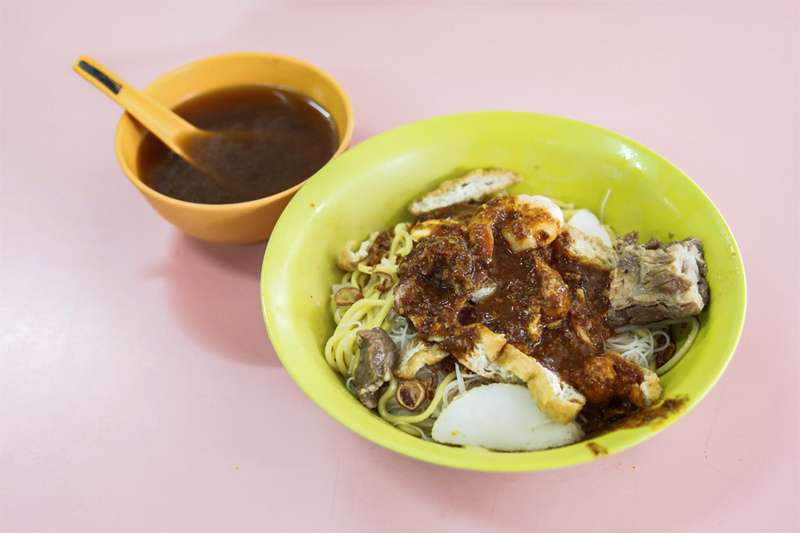 Their rendition of Fried Kway Teow Mee ($3.00, $4.00, $5.00) caters to health-conscious diners watching their calories and fat intake. 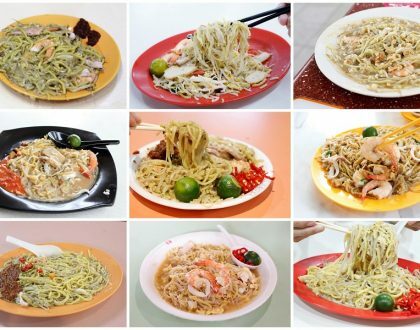 Hokkien Mee can divide fans – there are supporters of the wet and saucy; while others enjoy the dry and flavourful. 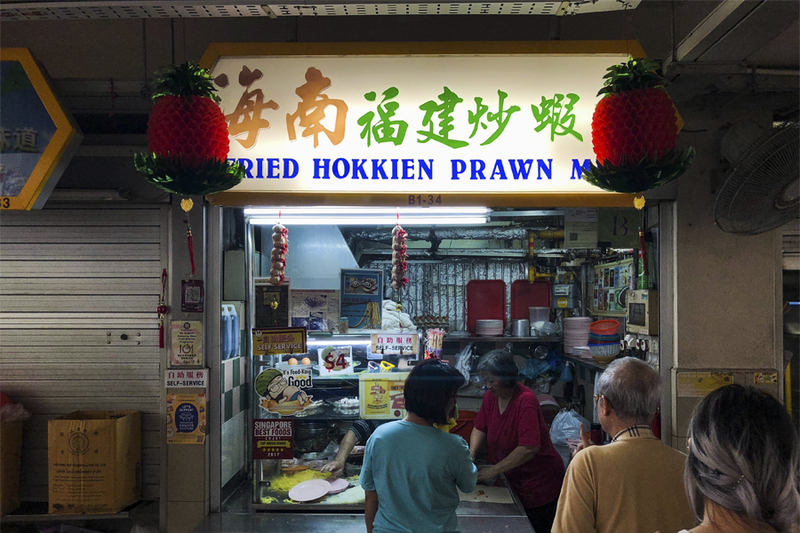 The Hokkien Mee at this stall stands out for a number of reasons. Firstly, it is cooked fresh on order. 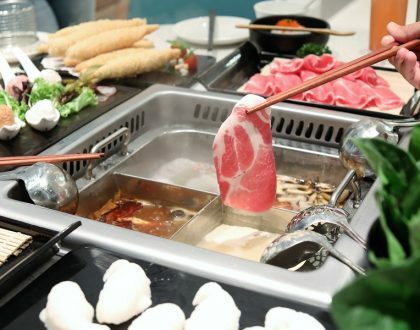 Secondly, the method of preparation is different, as the noodles are fried along with the stock until they completely absorbs the whole flavor. This gives you a rich taste in every mouthful. The Fried Hokkien Mee ($4) though disappointedly had a small serving size, came with delicious chilli for a tasteful kick to the noodles. 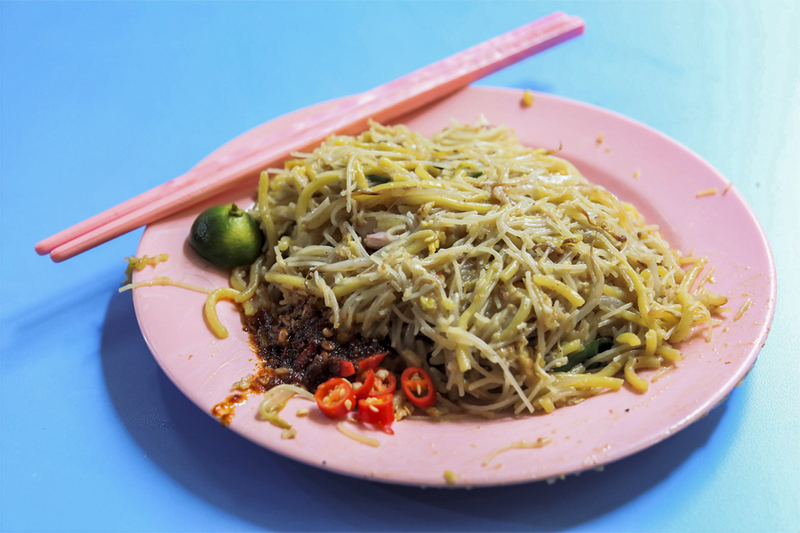 You may just dismiss this stall as yet another Prawn Noodle stall, but it is THE Chilli Mee that is the outstanding dish. 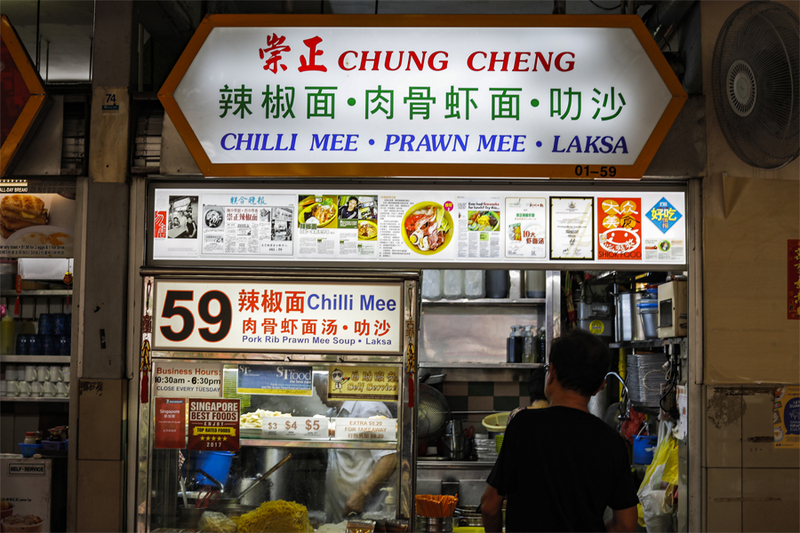 Selling Chilli Mee, Prawn Mee, and Laksa, priced at $3.00, $4.00 or $5.00 depending on the portion size, Chung Cheng is talked about its signature chili paste. What makes this house-made chili paste special is the combination of belacan, dried shrimps, garlic, onion and some secret spices. “One person one set”. 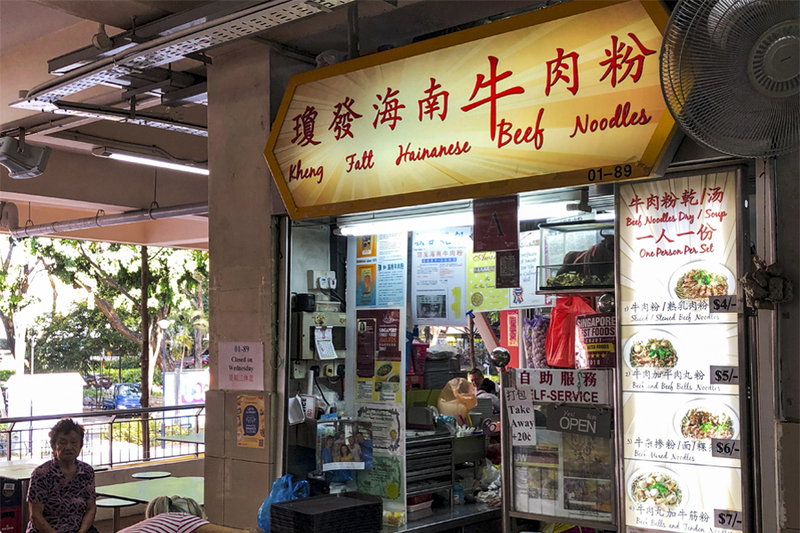 The stall has a variety of both dry and soup version of beef noodles, available at $4, $5, $6 and $7 depending if you want stewed beef, beef balls, or tendon. 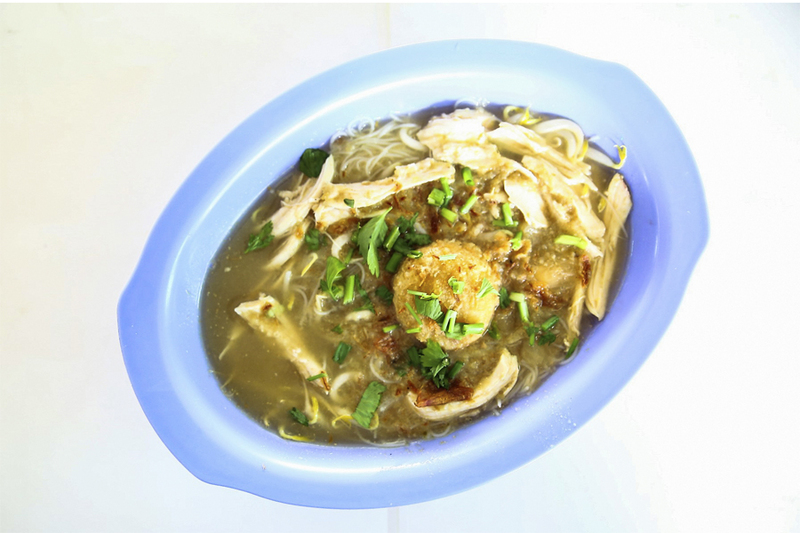 But they do not offer Beef Soup or Beef Ball soup ala carte unlike most other stalls. Well, well. While there is a limited selection, the Dry Beef Noodles ($5) comes with delightful sticky thick gravy almost bursting with flavor. I liked that the portion was just nice, which covered every strand of the rice noodles. Soup could have been more robust with fuller flavours though. 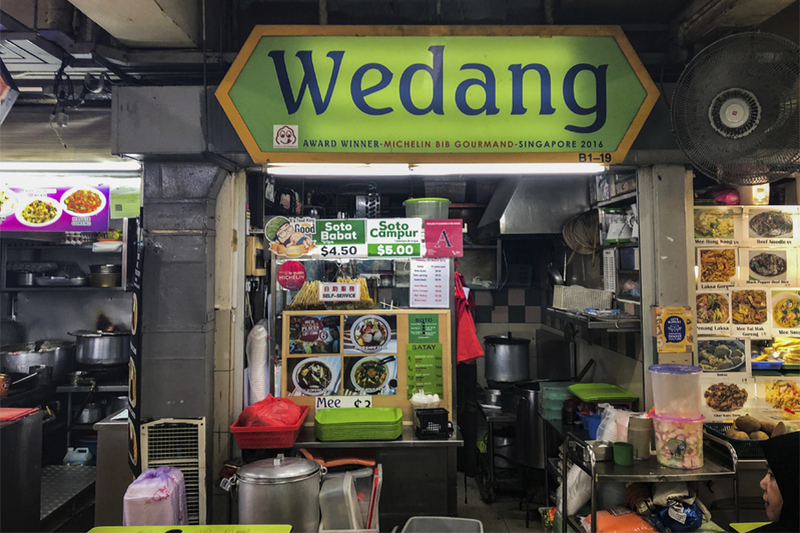 This is soon going to become one of my favourite Zi Char stalls in Singapore, for many good reasons. 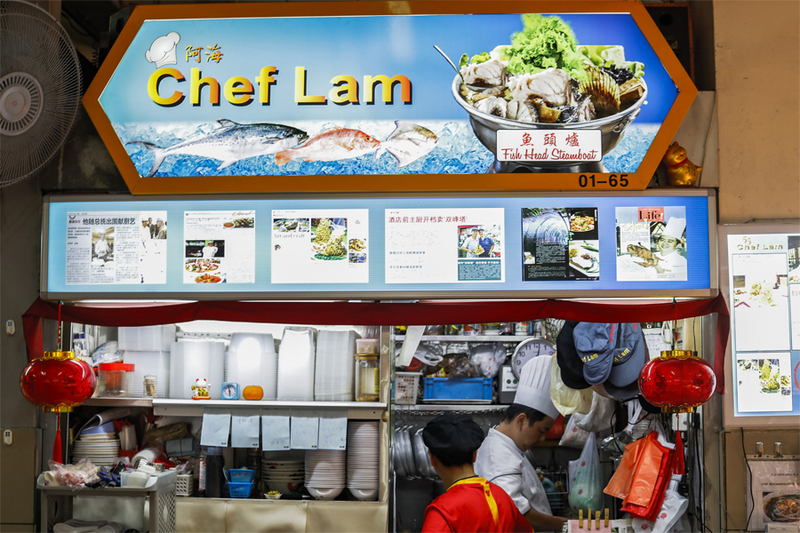 Chef Lam’s zi char stalls stands out due to its affordable pricing, interesting dishes, and restaurant-level skills in cooking. One thing you would notice is the chefs are in uniform and chef’s hat, hinting at the pride in their roles. 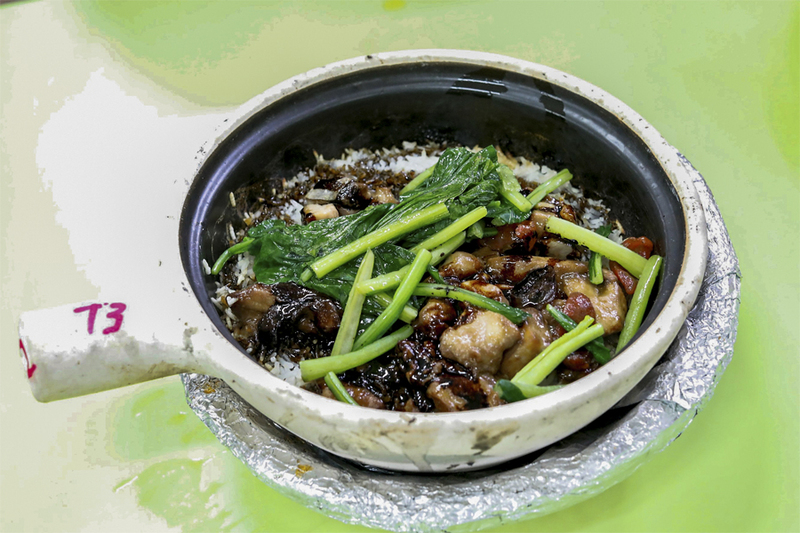 If there is ONE dish to order, it would be their “Twin Peaks”, otherwise called “Shuang Feng Tai”. 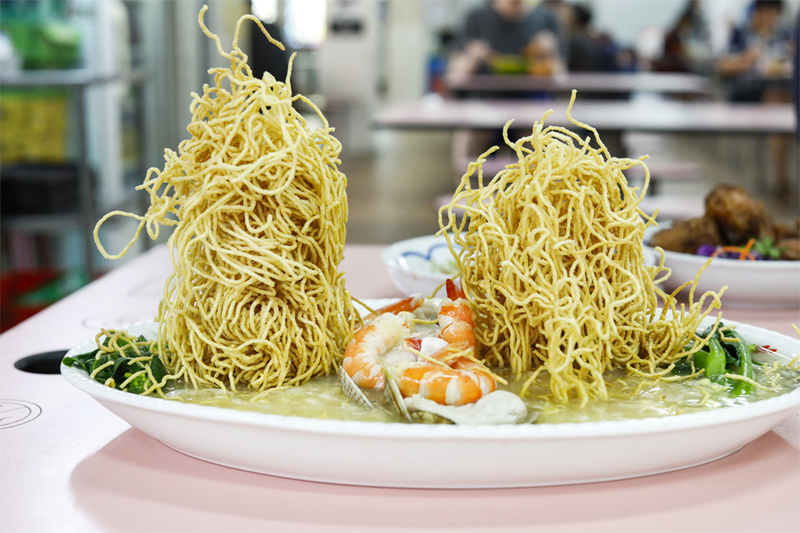 This is a Crispy Noodle Seafood dish ($10) of “sheng mian” on top of a base of sauce and generous seafood of sliced fish and prawns. Presentation was on-point, ingredient fresh, noodles tasty, and the seafood-egg sauce had a great smooth texture which tied all the components together. There is a cheaper version of this dish, but it comes with only one peak. The stall opens in the evening and is always swarming with crowd so you might have to wait a little for your turn. YaLoh (such a catchy name!) may be the newest kid in the block, but their offerings make it the one new stall to look out for. They are known for their Herbal Roasted Duck ($45 for whole, $24 for half, $12 for quarter) cooked with various kinds of herbs then roasted. If you come alone, go for the individual portion at $4.50. 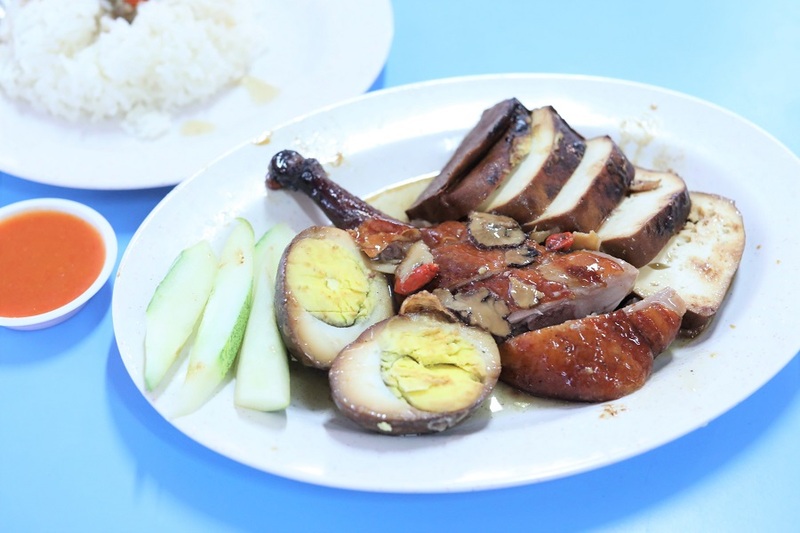 Other than the crisp skin, tender bite that is not too fatty, the one thing people would love is the light herbal sauce drenched over the rice. Usually you get those dark, braised sauce, but this is light yet wonderfully tasty. Also available are Roasted Pork Rice ($3), Char Siew Rice ($3), Herbal Roasted Duck Noodles ($4.50) and Herbal Roasted Chicken Rice ($4). Not expensive some more. What a find. The stall looks non-descript and ordinary, no newspaper cuttings what-so-ever, and you may just walk past it without a hint of its accolades. It was once awarded a Michelin Bib Gourmand. Wedang’s offerings are straightforward – Tahu Goreng (Malay style fried tofu with spicy peanut sauce., Gado Gado (a style of Indonesian salad with peanut sauce), Mee or Bee Hoon Soto Ayam (yellow spicy chicken soup with noodles or rice vermicelli) and Nasi Ayam (chicken rice), all at $3.00 per plate or bowl. The Bee Hoon Soto Ayam ($3), a Javanese-influenced dish of rice vermicelli with a deep fried begedil (potato cake), shredded chicken in yellow spicy chicken stock, was pleasingly tasty. Its soup base came across as being balanced, cloudy yet not overly rich, spicy but manageable. It is not as salty as some of the Mee Soto I have come across. 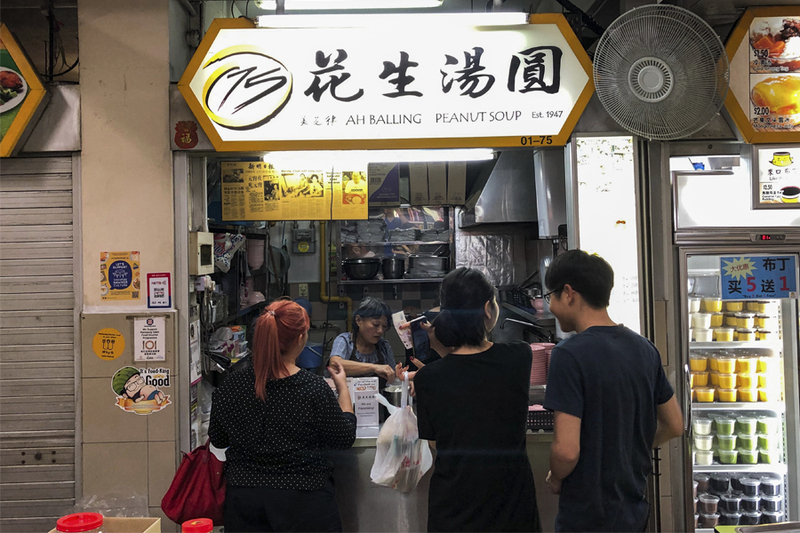 For a dessert treat at this food centre, 75 Ah Balling stall has a nice variety Tang Yuan filled with delicious fillings. Their peanut soup is the most popular choice (because the peanuts are really soft), but there are also ginger, almond and longan red dates soups. A single bowl of soup is only $1.40. You can pair it with glutinous rice balls aka Ah Balling filled with peanut, sesame, yam, matcha and red bean. 4 pieces along with soup comes in $2, five pieces for $2.30 and six pieces for $3. 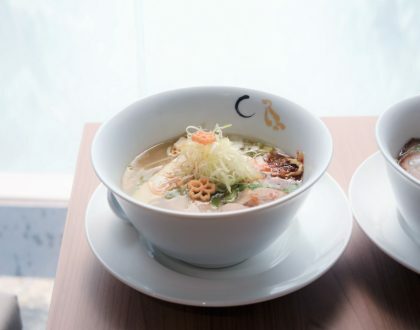 You can mix and match a variety of flavours, though the recommendation is the peanut soup and ah balling with red bean or mixed fillings.